This card was CASED from one that my upline had made. i just altered the color, added glitter and ribbon. This is a GREAT card, is simple and so versatile - it can be used for Mother's Day, Birthday, Thinking of You, Get Well Soon, With Sympathy, Wedding and many more occasions and events you may think of. Stamp stems in Certainly Celery. 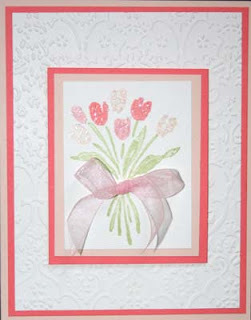 Stamp flowers in Blush Blossom, then use Pretty in Pink and Cameo Coral markers to color some of the buds. Stamp image. Use two way glue pen to put Dazzling Diamonds on flowers (where desired). Make bow and adhere using Mini Glue Dots. Assemble and adhere the rest of the card.